A mechanical permit is required for any new construction, alterations, additions, and/or other types of mechanical work performed in the City of Harrisonburg. Questions regarding mechanical permits can be answered by the Community Development Building Inspections Division at 540-432-7700. Depending on the complexity of the project, drawings and specifications may be required. These drawings and/or specifications would include, but not be limited to, floor plans showing all registers, plenums, duct work, and grills for exhausts, make up, and supplies; the size, location, and type of all heating and cooling equipment; the size and location of all fans; the location, size and type of all duct work; and other plans, calculations, or specifications as may be deemed necessary by the building inspection office. The owner's complete name, present mailing address and phone number. The kW, ratings, horsepower, etc. of all equipment. 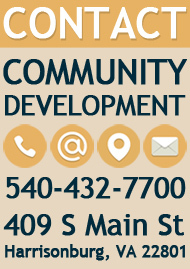 The mechanical contractor's complete name or business name, present mailing address, phone number, certification number, copy of class "A" , "B" or "C" state contractor's number, and City of Harrisonburg business license number. 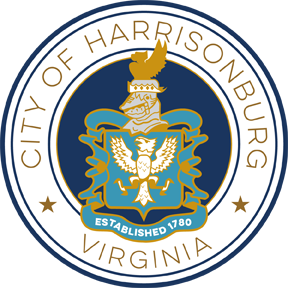 The appropriate fee based on the total value of mechanical work being done, made payable to the City of Harrisonburg. Provided that there are no problems, insufficient information or drawings, the mechanical permit will be issued at the time of application. The permit is not valid until the permit fee has been paid and the permit placard posted on the job site. The mechanical permit shall be displayed on the outside of the building or premises where it is plainly visible from the street and shall not be removed until all work is complete and the building or structure is ready for use. Under slab (duct work, fuel lines, etc.). Trench (duct work, fuel lines, etc.). Rough-in (duct work, paned off plenum spaces, tanks, etc.). Final (the mechanical system is to be fully operational). Other inspections as may be deemed necessary. Rough-in, slab, trench and final mechanical inspections are to be made and passed prior to building inspections being scheduled. For other than a final inspection, the installation is not to be concealed prior to inspection and approval. The mechanical permit becomes void if work has not commenced within, or is suspended for a period of six months or more. If desiring to do so, the owner may do the work as long as the proper permit has been obtained, all required inspections are called for, all applicable fees are paid, and an affidavit is signed by the owner.